Cut 3 squares in the top of the loaf of bread, being careful not to cut through the bottom. Cut the removed bread squares into breadsticks. 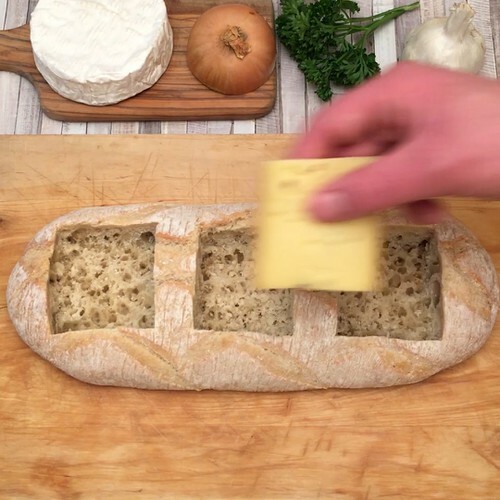 Fill each of the squares with a different type of your chosen cheeses. Add a topping to each cheese; for example fried onions, dried rosemary and grilled bacon. Repeat the cheese and topping layers and finish with a layer of cheese on the top of each square. Combine the olive oil with finely chopped garlic, chopped parsley and parmesan cheese. Place the loaf of bread and the breadsticks on the baking tray on top of baking paper, and brush the breadstocks with the olive oil mixture. Bake for 30 minutes at 200°C. Serve hot by dipping the breadsticks into the melted cheese fondues.